Care must be taken during eating to avoid damaging brackets and wires. Excessive breakage results in longer treatment time. 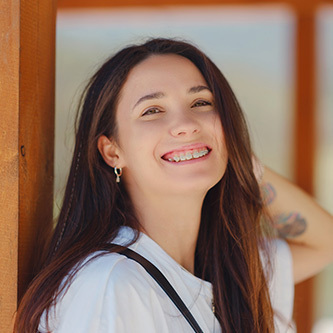 By following a few simple guidelines you can protect your teeth and appliances and help ensure that you get your braces off as soon as possible! Hard candy, suckers, Jolly Ranchers, mints, etc. Chewy caramels, taffy, Starbursts, Skittles, etc. You'll soon find there are many foods you CAN eat! As long as you are careful, you can still enjoy most of your favorite foods and may even find some new treats. Proper oral hygiene (keeping your teeth clean) is VERY important to the health of your teeth and gums and the success of your orthodontic treatment. It is imperative that you brush your teeth several times a day, ideally every time you eat. Not keeping your teeth clean will result in permanent white stains on the teeth and possbily cavities that must be filled by the dentist. Poor brushing also extends treatment time. In case of a sports emergency, be sure to immediately check your mouth and appliance for damage. If you notice any loose teeth, appliance damage, or your bite feels different, please contact our office right away. You can temporarily relieve the discomfort by applying wax or rinsing your mouth with warm saltwater. It is imperative that orthodontic patients not use tobacco (in any form) during their treatment or risk significant, irreversible damage to the teeth, gums and bones. It is very important to visit your generall dentist every 6 months during treatment for check ups and cleanings. Your orthodontist and general dentist work together to assure you maintain healthy teeth and gums throughout your treatment.